Grayrock Cave is a medium-sized cave east-northeast of Skingrad containing monsters. It contains two zones: Grayrock Cave and Grayrock Shambles. 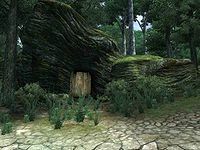 This cave contains a staggering 95 Cairn Bolete plants, which makes it the second largest concentration in the game after Serpent Hollow Cave. 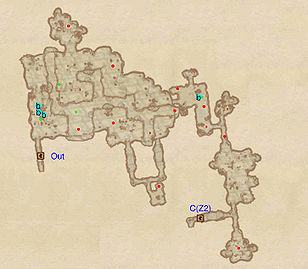 24 Wisp Stalk plants can also be found. This location's map marker (M on map) is named Grayrock Cave (editor name GrayRockCaveMapMarker). The entrance door is ENE of the marker, 50 feet away. When you enter Grayrock Cave it becomes apparent that this cave may have had human occupants before the monsters arrived; a big pile of bones is scattered in the first small tunnel and three bedrolls at b can be found inside the first large chamber. The bedrolls are placed atop of a plateau and you can jump easily to the other high plateaus, although it will net you nothing but a potion chest and several encounters with leveled monsters. Jump down from the plateaus and locate the eastern passageway and head through it to reach a small chamber with a chest and a bedroll at b guarded by two nearby foes. Head south and make your way to door C which leads to the second zone, Grayrock Shambles. Upon entering Grayrock Shambles from door C, search the northern room and fight the opposition, then head south until the path bends and lands you in a smaller room. Head north for a chest and a possible encounter with a friendly Orc Adventurer (O). 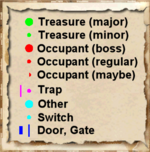 Afterwards, backtrack to the previous room and proceed west to head to the northwestern room for the last chest. Finally, leave the cave through door Out, which leads to an alternative entrance south of the map marker and west of Fort Vlastarus.